I hope this email finds you well and enjoying the beautiful fall weather! As your Lake County Government and Forest Preserve representative, it is important to me that I hear your concerns and questions about living and working in Lake County. To that end, I will have open office hours in mid-November. For your convenience I will also be available on three evenings. If you are unable to attend one of these sessions but would like to speak with me, please don’t hesitate to contact me at 224-212-0331 or via email at smhart@lakecountyil.gov. If you are interested in having me attend a local event to speak about the County or Forest Preserves please let me know. As always, it is a pleasure to serve you. Lake County remains AAA-rated, allowing us to borrow money at the lowest rate. This is a balanced budget and is $6MM less than last year. Headcount is down by 25. Approximately 32% of the revenue is from property taxes. Due to the uncertainty of the State budget, we must plan for potential funding cuts. We have set aside $3.7MM in anticipation of these cuts. If funding cuts do not occur, these monies will be used for long-term capital investment. A five year plan for capital improvements is developed and updated annually. We do not use one-time money for ongoing expenses, nor do we use debt for operations. We use data to align operational staffing levels. Lake County remains fiscally stable due to our focus on strategic, long-term, data-driven decision-making, and our commitment to fiscal responsibility. Many memorials will take place on November 11 to honor the men and women who have served during times of war, but these memorials do not tell the personal stories of hardship, sacrifice and heroism. By interviewing veterans, the Lake County Veterans History Project captures these stories so current and future generations can understand and appreciate what they did in service to our country. Watch this video to meet some veterans who took part in the project. To learn more, visit our web page. If you would like to share your story or would like to volunteer to interview a veteran, please email me for additional information. A revised concept plan for the Fort Sheridan Forest Preserve was approved by the Planning and Restoration Committee (on which I serve) in August. In preparation of this most recent plan, Forest Preserve staff gathered additional data to guide the plan, including on-site surveys, comment review, and patterns of visitor and parking lot use. Three parking lots were monitored four times per day, every day, March 17-August 17. As a result of their study, staff concluded that 65 total spaces are needed at the preserve for efficient utilization of space, and the revised plan shows that the existing lot at the southeast (Gilgare Lane) will remain but would be reduced to approximately 45 spaces. With this plan there is potential to share services with neighboring municipalities and other agencies and we will reduce impervious surface and costs. As you may know, I was very concerned that the elimination of the parking lot at Gilgare Lane would restrict access. I am very happy with this revised plan and appreciate the time that residents took to view the plan and provide feedback. The data-gathering done by staff was exhaustive and time-consuming, but I believe it resulted in an excellent plan for Fort Sheridan. Staff will next develop a final master plan and cost estimates. View the revised concept plan. To learn more, visit the forest preserves project website. To provide comments, send an email to Fort@LCFPD.org. Lake County and local mayors have been working for many months on a land use corridor plan for the proposed IL Route 53. You can learn about this draft plan and submit feedback by mail, email or online. More information. To learn more about the proposed IL Route 53 extension, visit http://ilroute53.org/. The Lake County Division of Transportation (LCDOT) is hosting a Public Information Meeting for the study of a bike path along the IL Rte. 137 corridor between the Independence Grove Forest Preserve and Sheridan Road. This bike path would provide a connection between the Robert McClory bike path and the DesPlaines River Trail. Participants will see the proposed project and schedule and provide feedback. Wed., Nov. 4, 6:00-8:00 pm at Independence Grove Forest Preserve, Libertyville. Get rid of your hard-to-recycle items at Recycle-O-Rama from 9 a.m. to 1 p.m. Oct. 24 at the Lake County Division of Transportation, 600 W. Winchester Road, Libertyville. Propane tanks, bikes, keys, stuffed animals, car seats and a whole lot more will be accepted. View the complete list of accepted items. Through the generosity of the Save-A-Star Foundation, residents can dispose of their unwanted prescription drugs safely at over 27 police departments across Lake County. When medications are kept in homes, flushed down the toilet or thrown out in the trash, there are environmental, health, and safety concerns. Last month I watched as three police departments brought these drugs to SWALCO so they can be rendered ineffective and disposed of properly. Over 9,184 lbs. (4.5 tons) of drugs have been collected since February 2015. Of this, over 47 lbs. were controlled substances, with a combined street value of over $646,000. There has been a concentrated legislative effort on both the east and west coasts to increase the number of these sites by collaborating with manufacturers, retailers, hospitals, and health clinics to collect more pharmaceuticals and keep them out of the hands of children and protect our environment. This is just one of many strategies being utilized to combat the current-and growing-opiate addiction crisis in the United States. The Lake County Sheriff's Office has received federal funding to purchase body-worn cameras for Sheriff's deputies as part of the Body-Worn Camera Pilot Implementation Program. The Sheriff’s Office was one of only three Illinois law enforcement agencies to be awarded this funding. The Sheriff's Office will be placing an order for 292 body cameras, which will be worn by sworn members of the Sheriff’s Office who interact with the public on a daily basis. Find more info on the Sheriff’s Office website. Lake County teens who may be struggling or know someone who may be struggling with mental health issues can get immediate assistance using a text-communication system called Text-A-Tip. Users can text the phrase “LAKECO” to the number 274637 to receive a response from a licensed clinician while remaining anonymous. Watch this video to find out how Text-A-Tip can help save lives. Lake County’s Strategic Plan, which serves as our road map over the next several years, identifies five strategic goals related to transportation, sustainability, healthy communities, economic opportunities and public safety. Residents helped shape the plan by providing input at a series of community forums. Residents also said they wanted to stay informed on progress being made toward these goals. In an effort to be more accountable, accessible and transparent, we’ve posted our progress here. 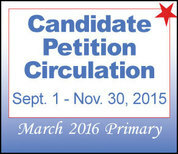 Established political party Lake County candidates who want to appear on the March 2016 General Primary Election ballot can get petition packets at www.LakeCandidatePower.info. Candidates can also visit the Lake County Clerk's Office for paper copies until Nov. 30. Call 847-377-2314 for more information. The Lake County Clerk's Office is seeking election workers for the 2016 presidential elections on March 15 and Nov. 8. Apply by visiting the county clerk’s election workers web page. For information, call 847-377-2408. Mitchell, a yellow Labrador retriever, will help provide comfort, compassion and companionship to children who are involved in crimes involving sexual and physical abuse. Mitchell will work with the Children’s Advocacy Center, which assists with the investigation and prosecution of these crimes. A professionally certified and trained service dog, Mitchell will accompany children when needed as they talk with officials about their abuse. Watch this video to learn more about Mitchell. The weather is getting cooler. Leaves are changing. Fall is coming. From pumpkin patches to family festivals and haunted houses, Visit Lake County has your guide to enjoy Lake County this season. Discover what to do this fall. Lake County recently celebrated the completion of the single largest construction project in LCDOT's history! The grade separation and intersection improvement at Rollins Road and IL Route 83 is complete. Watch this video of the Rollins Gateway celebration to learn more about how this project has improved transportation in Central Lake County.